Meghan Slocum has a bachelor's degree in English from Whitman College. In the past she's written for Whitman College's newspaper and organizations that she interned for, including Breathe California, Blossom Birth and the Silicon Valley Leadership Group. Probiotics, also known as "good bacteria," are living microorganisms similar to those that populate the human intestines. Lactobacillus acidophilus, commonly known as acidophilus or L. acidophilus, is a particular strain of probiotic. There are many different probiotic strains, each of which affects the body in different ways. Acidophilus can be differentiated from a generic probiotic based on its source and effectiveness in treating various conditions. Probiotics are found in a wide variety of fermented foods, such as cultured milk products like kefir, yogurt and cheese; fermented vegetables like sauerkraut and kimchi; and probiotic drinks like water kefir and coconut kefir. Probiotics can also be taken in capsule form as dietary supplements. 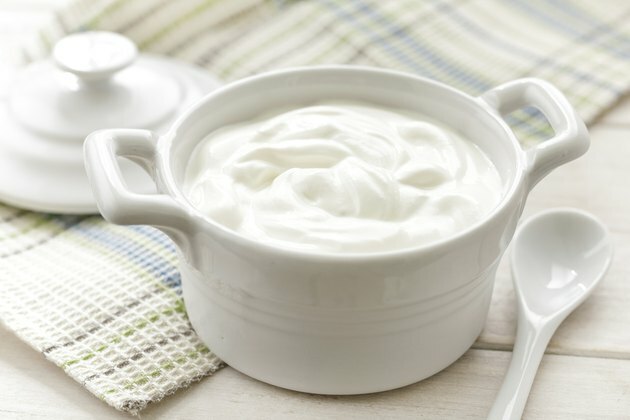 The particular probiotic strain acidophilus is commonly found in yogurt and other fermented foods such as miso and tempeh. It is also available in probiotic dietary supplements. If you want to consume acidophilus, be sure to read product labels, as it is not always present in the foods you'd expect to find it in. Although most research on acidophilus is still preliminary, existing research shows that acidophilus can be helpful in treating bacterial vaginosis. Some studies also suggest that acidophilus may help prevent traveler's diarrhea, although other studies have not found this same benefit. Given the long history of humans consuming acidophilus, it's likely that the bacteria confers many other benefits that scientists have yet to discover. Probiotics other than acidophilus are helpful in many different ways. As with acidophilus, researchers are only beginning to understand the effectiveness of particular probiotic strains. Probiotics seem most promising for treating digestion issues, such as diarrhea, irritable bowel syndrome and inflammatory bowel disease. They can also be effective in preventing and treating skin conditions such as eczema. Probiotics are also commonly used to repopulate your gut with good bacteria after a round of antibiotics, as antibiotics destroy both good and bad bacteria in the course of fighting an infection. Probiotics in general and acidophilus in particular are generally considered to be safe: humans have been consuming probiotics in foods for thousands of years and most types of probiotics are already present in your body. Theoretically, probiotics could pose a risk to people with weak immune systems, so be sure consult your doctor prior to taking probiotics if you're concerned about your immune function. Allergic reactions can also a concern, as many acidophilus supplements are cultured in milk products. Be diligent about reading food and supplement labels if you need to be concerned about food allergies.